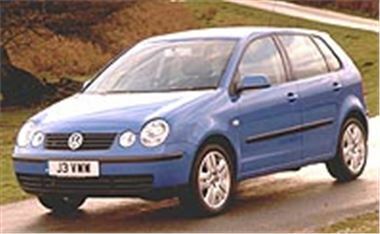 Although RHD supplies of the 2002 Polo will not be available for delivery before 8th February 2002 (might as well wait for the 02 March reg) and final prices have not been announced VW dealers are now accepting 'reservations' for these cars. There is a choice of three or five door hatchback, five engines and five trim options. Engines available from launch will be 3-cylinder 1.2 12v with 65bhp, 4-cylinder 1.4 16v with 74bhp, 4-cylinder 1.9 SDI with 65bhp, 3-cylinder 1.4 TDI PD with 75bhp or 4-cylinder 1.9 TDI PD with 100bhp. Trim specs are designated E, S, S a/c, SE and Sport. All models have power steering, ABS, twin front and twin side airbags, a three year warranty and a twelve year no perforation warranty. Many options are available, enabling buyers to have their new Polo built to their specification.